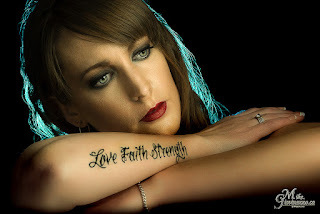 Many tattoos have a special story behind them - perhaps a personal milestone like overcoming personal hardships, beating cancer, or to commemorate that unique accomplishment ... I'm looking for those tattoos which are not just pretty ink we add to our skin, I seek to capture the mark a tattoo leaves on your soul. Contact me if you want to get involved. My bum tattoo was done when I was 18. It is a special tribute to my adoptive mom. My real mom had me when she was only 16. She was in an abusive relationship and ran away to have me, her baby. Understanding her situation, she decided to give me up for adoption. My real mom knew she could never give me a proper life and she never even named me. The lovely women who raised me worked at the hospital where I was born. While she got to hold me right away, she had to file the necessary papers and get me officially named so for 4 months I was just “Baby Girl”. Tattoos were frowned upon by my dad, so I got it on my bum so he would not see it. On Christmas Day when I was 23 I got a key chain with the words “baby girl”. We finally told dad and he just laughed. I thought you were sitting and driving funny for a while. With my background, having a child was of course very dear to me. Unfortunately, due an earlier surgery doctors told me I’d never have my own child. Always sad on Mother’s days and when I saw mothers in the malls, I wondered if perhaps prior relationships might have worked if she’d tried harder. Still I kept trying. I spent 10 long years trying and had given up. There was an emptiness I wanted to fill. Suddenly I found I was pregnant. At first, I was both surprised and angry – I felt lied to. I could get pregnant. It was however a terrible pregnancy. I had to have 9 weeks of bed rest, plus constant IV for the baby. My water broke at 27 weeks “Lyra Jean” was born quite premature. The hospital was amazing and helped pull her through. Looking back, is a joy. I had my miracle and was officially a mom. While some other women might be jealous, I sort of lamented my luck. You see, I had no Tiger Stripes, never had stretch marks, no lasting scars. So, I scared myself … and got the tattoo “Lyra Jean” on my ribs. It’s not just another tattoo, but a proud symbol of my daughter, my own pride and joy. A story gone full circle. So many of us are touched by cancer, be it personally or via a loved one. Hearing that dreadful diagnosis creates instant fear and panic. Today we share the story of a three-time cancer survivor Kelly Davidson. You would be hard pressed to find a more positive and amazing lady. This is her Tattoo Tale. For sure here is a lady that tries to focus on the positive believing there is a rainbow at the end of the storm. The breast cancer was not her only challenge. She was diagnosed with Hodgkin’s lymphoma at age 11. Then came her breast cancer at 28, with a mastectomy at 28 and again at 29. Plus at age 31 she was diagnosed with thyroid cancer. Years after her last cancer diagnoses, she is deemed to be in complete remission. I met my husband after the mastectomies and he still saw me as beautiful (even when I didn’t). We got married in 2013 and a year later we had our beautiful son. She says she has grown so much and appreciates everything; taking nothing for granted. Having had her thyroid and spleen removed, dealing with 33 treatments of radiation starting at age 11 plus enduring 6 chemotherapy treatments for breast cancer, she understands the fear and worry. I am living proof of that. Who among us is so fortunate to have a life without hardships. Many lament their challenges and cite their difficulties as the reasons they are held back, and can’t possibly take control and improve their situation. Helen Keller once said: Only through experience of trial and suffering can the soul be strengthened, ambition inspired, and success achieved. Most of my tattoos are related to a past filled with hardships and the victories that go with them. Many of my tattoos started appearing after my therapy in 2008, I consider myself to have been given a second chance, that is why the word ‘’LUCK’’ is tattooed on my fingers. I had what many might call a delinquent lifestyle, filled with drugs and violence. It was a lifestyle in which I felt trapped for a very long time. Then one day I woke with a moment of clarity. I woke up telling myself I want to understand and change who I am. That is why the words ‘’EFFORT’’ and ‘’COMFORT’ are tattooed on my forearms. I wanted to take the necessary and difficult steps to bring comfort into my life. Life always gives us challenges to work through, it teaches us to control our demons and understand who we are, that is why I have a demon trapped within my flesh tattooed on my chest, to never forget to keep the demons inside me under control and never let them out. Today, I am a strong and independent woman who has more control over her life. Never again will I let anyone or anything take that control away from me. I am a strong willed woman with a tender heart. That is why I have several cutesy pigtailed skulls and the word ‘’DANGER’’ tattooed on my lower belly. I never want to forget why I became the strong woman I am today and that is why I will get tattoos throughout all of my life. Tattoos are, for me, a way to express myself just like a painter and his canvas. It is also a way to externalize the pain of each hardship. I have learned that my actions and my past do not define me. I can change. When I imprint tattoos on my body, I ultimately imprint them within myself, shaping who I am, and what I shall become. We should all focus forward and never forget - why we are, who we are. The personal struggles of others are often not apparent to us. We sometimes meet someone who exhibits strength, determination and a sense of purpose. It’s easy to assume they are one of the lucky ones; born with all the right attributes. The reality is people, like tempered steel, are often forged in the fires of turmoil. 11 years ago I was in the best shape of my life. I worked out 2 times a day. I taught hip hop, and ran. I also played baseball on 2 different teams. Then one night 11 years ago it all changed. I just stumbled and fell. Moments later my legs were in massive pain and I could not move them. It all seemed so impossible. I always played baseball and was just swinging the bat when my legs gave way. Next thing I knew, they were saying I would never walk again. How could that be? I was in the hospital for 6 months. The treatment center in the city was too far for my family to travel regularly. I felt deserted and alone. Depression was setting in and I needed to get past that. I was not ready to just give up. So after fighting and fighting with all the strength and determination that I had, we started to see tiny signs of progress. It was soooo slow but I was able to start walking with a walker. Then 2 years later I progressed to a cane, then from there - walking slowly without it. It took about 7 years before I was able to walk somewhat normal again. It was 5 years after that accident, during my long recovery that I chose to get a hummingbird tattoo as a token of my progress towards recovery. They are such a strong willed bird and they were my inspiration to keep fighting harder and encouraged me to get to the point where I am today. Walking was not the only issue. I gained massive amounts of weight and was not happy with myself. I went from 115 pounds to 190, all in about 6 months. I went from being so active and loving life to lying in a hospital bed for months at a time. With low self-esteem and my family away for much of the recovery period I was in a very dark hard place. It was just one bad thing after another, and at one point I tried to end my life. I had to reach deep inside myself to find strength I was not sure I had. Today I have 2 other tattoos that commemorate my struggles. The one on my arm (with the words love faith strength) and on my rib cage (always remember). They remind me of those inner demons I fought about 2 years ago. I chose the words on my arm (love faith strength) as my new life’s motto. These are so significant to me. I need to always remember how important it is for me to love myself, have faith in myself and reach for the inner strength to do this when things are not perfect. Today I see the world as a different place now. I remember the struggles and know setbacks can and do happen. It is up to me to rise above them. I look back and see how far I’ve come. This truly was a life changing experience. For anyone reading this, know that others can’t be aware of your own inner demons and personal challenges. We all have personal crutches of one sort of another. We lean on others, past experiences and various excuses; telling ourselves we can't go further. Look beyond these. Look inside yourself, deep inside, and you will see strength and resolve you never knew you possessed. All images and text copyright of Mike Giovinazzo . Picture Window theme. Powered by Blogger.